Today we have here my very first Etsy customer – Sara @ Made by Sara: go and add her to your blogroll, if you don’t already have done it! She’s a super nice Portuguese mom and she writes about her sewing journey and mommyhood: here’s your chance to learn her native language, since she writes a bilingual blog! Hi! I am Sara and I blog over Made by Sara. I am a mom to three kids under six and I love all things handmade. 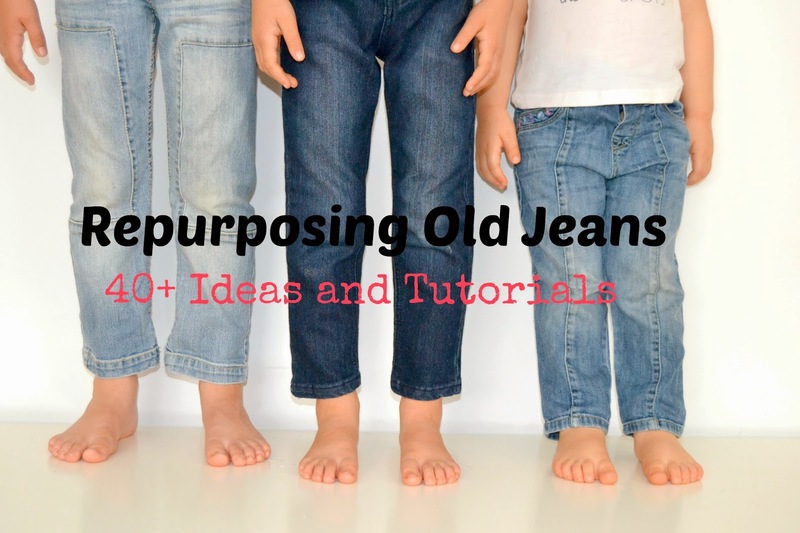 I am so excited to be here at Serger Pepper today to give you the ultimate idea and tutorial list for repurposing old jeans! These are my kids and their overworn and outgrown (above the ankle) old jeans. Did you know that denim was born in Italy? (How fun is that, Irene? 🙂 ) Denim was originally worn by Italian sailors from Genoa in the 1500s and was known as the “blue de Genes”. Nimes (in France) tried to replicate the fabric but failed. Their product was called “de Nimes”. Hence the English words Blue Jeans and Denim! 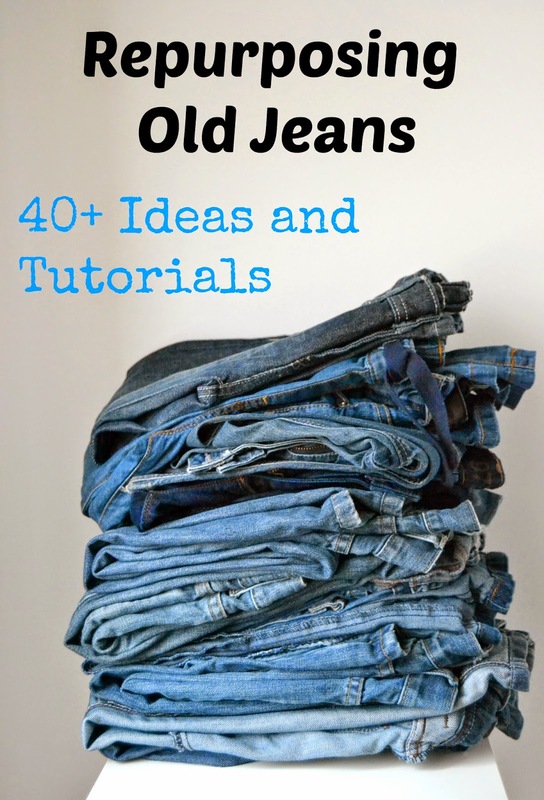 I came up with this blog post while I was looking to this big pile of old jeans from the five of us and wondering what to do with them… Some were outgrown and some are just too damaged or tear in a certain part… I have kept them for about one year now – I can’t just throw them away, right? – but the time has come to actually make something out of them (DH keeps complaining about all the stuff I keep to make something “one day”… :)). I think I have reused denim clothing only once – I have turned a baby’s jeans dungarees into a girls size 5 skirt – but I can’t wait to make more refashioning and to make something out of all those denim scraps/ leftovers. This post is not mainly about refashioning – turning a garment into another garment. If you are looking for some inspiration on women clothes, there are already a lot all around fashion & DIY blogs. If you are like me – sewing mostly for kids – then you may want to have a look at these amazing ideas of refashioning kids clothes from do Guincho, Kid Approved and Things for Boys. Before we go any further, we need to learn how to make the most out of a pair of jeans, right? Here you have two tutorials on how to cut old jeans the best way! If you need some great tips and tricks on how to sew with denim, you have to (I mean, you really really have to!) take a look into this Serger Pepper’s post on “Sewing Denim like a Pro“! 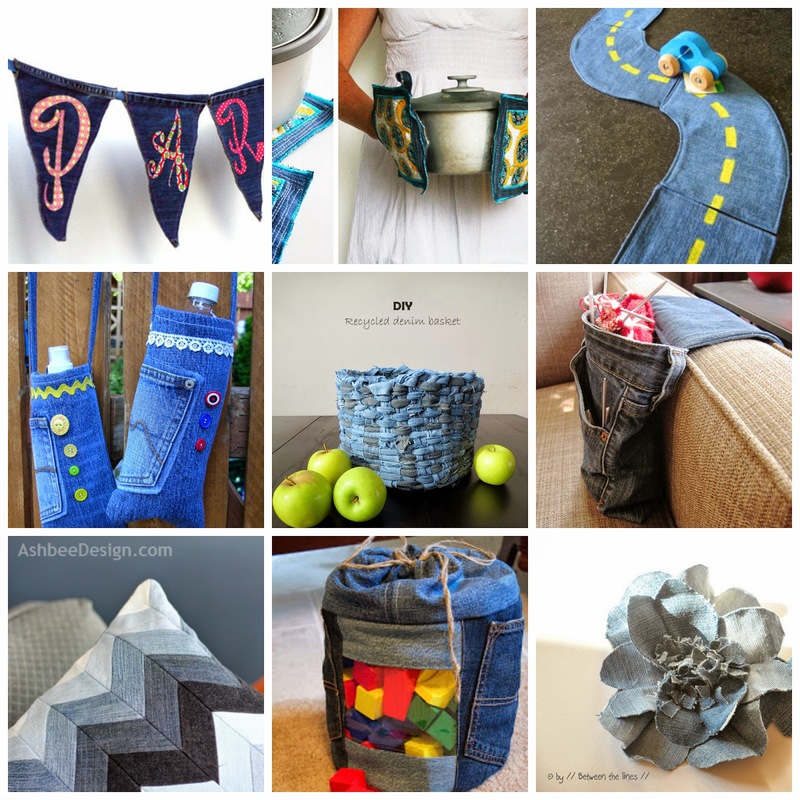 And now, here it is a big list of links for ideas and tutorials for repurposing and recycling denim! You can find the links below! Hopefully these tutorials will inspire you to create new ideas and projects! If that is the case make sure to come back and link it up in the comments, will you? We would love to see it and even include it in a future denim repurposing roundup! And, after all those sewing denim… better clean your serger and sewing machines! I don’t know anything about sewing or quilting, but my mom tried her hand at it. One of her ideas was to upcycle or repurpose before anyone knew there was a term for it. She had three rapidly growing daughters whose jeans could be hand-me-downs only so many times. When we moved to a new house (parsonage) and moved the house from the bottom of the hill to the top so we would not have to live with a pool in the basement, she had an overflow of jeans that we had no time to place in a rummage sale. Lo and behold, buy the time the house was ready for the church to see what they spent to bring a new pastor and his family in, mom had three quilts made from our jeans on display….zippers, pockets, crotches and all. Front and back. I was so embarrassed! When the open house was over, mom told me to look in the pockets. Would you believe that people actually left money in them?!? I must have got at least $5. Lol. To this day, we all still have and cherish our unique denim quilts. One sister used hers (blue trim) for her son and it has turned raggedy by now. Me and my other sister have it available for comfort. Mine was a dusty rose colored trim (no daughters for me). Can’t remember the other color. Heirlooms forever. I can just imagine how beautiful a quilt made from white jeans would look for an awesome wedding gift. Maybe without the crotches and stuff but nice squares and raggy detail. Sigh….wish I could sew.